When the Berkeley High School Jazz Ensemble visited his 5th grade class, Dave fell in love with the saxophone. He later became a star member of the BHS Jazz Ensemble and spent his summers making music under the redwoods at Cazadero Music camp. After graduation from BHS, Dave continued his music education at Berklee College of Music in Boston, receiving a bachelor’s degree in Music Production and Engineering & Tenor Saxophone. Returning home to the Bay Area in 1992, Dave quickly became a well-known figure on the Bay Area jazz scene where he was a founding member of the acid-jazz Charlie Hunter Trio, with their debut CD on Prawnsong Records produced by Les Claypool (Primus), and two recordings for Blue Note Records. In 1996, Dave recorded his debut CD as a leader for Monarch Records, Raven,produced by the late Bud Spangler. Dave’s two follow up CD’s, In The Long Run(1998-Monarch) and State Of Mind (2003-Milestone) were produced by legendary jazz producer Orin Keepnews. 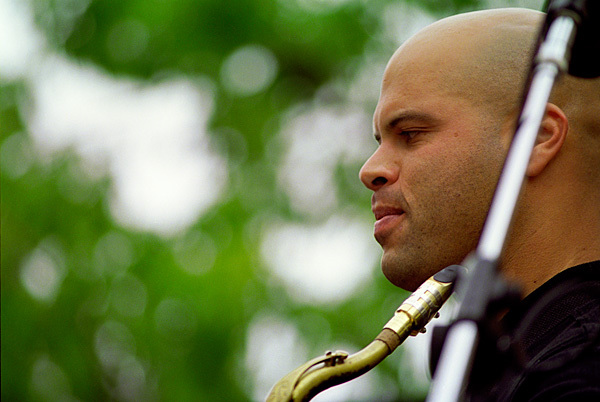 He was voted 2nd in the JAZZIZ readers poll in 1997 for Best New Artist behind Diana Krall and has won several Bay Area and California Music Awards, including the Best Jazz Artist (1999), and Best Jazz Album award for State Of Mind(2004). Dave has since performed, recorded and toured - nationally and internationally - with a diverse group of world renowned artists and groups including Kenny Barron, Bill Bell, The Black Crowes, The Grateful Dead, Nneena Freelon, Mickey Hart, Bruce Hornsby, Bobby Hutcherson, Phil Lesh, Eddie Marshall, Christian McBride, Mulgrew Miller, Donny Osmond, Bonnie Raitt, Patrice Rushen, Boz Scaggs and Bob Weir. In addition, Dave produced and/or engineered several CDs including his vocalist sister Zoe Ellis’ debut CD Live At Anna’s Jazz Island (2007), released by their music production and publishing company Zadell Media Productions. Dave has always been interested in helping the next generation of players succeed. He performed and taught in the San Francisco Symphony’s Adventures In Music program; instructed both recording and jazz ensemble courses at the California Jazz Conservatory in Berkeley; served as a clinician, master class instructor and adjudicator for Monterey Jazz Festival's Next Generation High School Jazz Competition, and the Campana Jazz Festival. He has coached jazz ensembles and combos, taught saxophone, music theory, ear training and musicianship for Berkeley High School, Albany High School, Longfellow Middle School, Jazz Camp West, UC Berkeley’s Young Musicians Program, and Stanford Jazz Workshop. He continues to teach privately, and to perform regularly in the greater Bay Area.